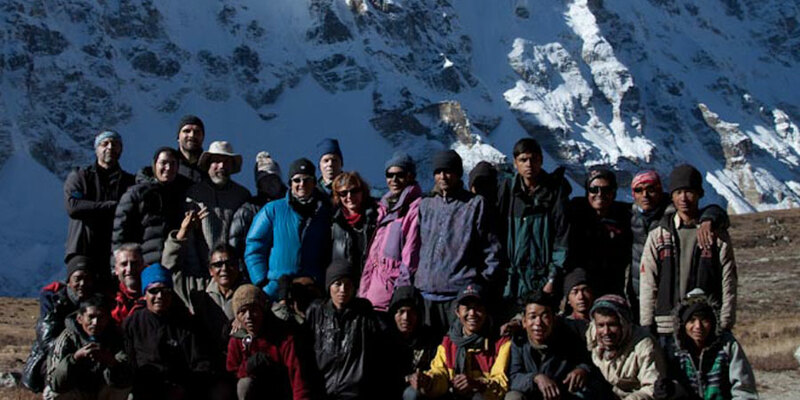 Kanchenjunga circuit trekking is one of the most popular trekking route in Kanchenjunga region. 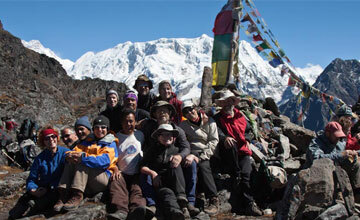 Kanchenjunga circuit trekking known as Kanchenjunga base camp trek include both Pangpema base camp & Oktang base camp. Kanchenjunga trek offer beautiful Himalayan views of Mt. Kanchenjunga 8586m, Mt. Lhotse 8516, Mt. Makalu 8463m, Jhanu Himal , Nepal peak, Tibetan monasteries, mixed culture with rhododendrons forest. 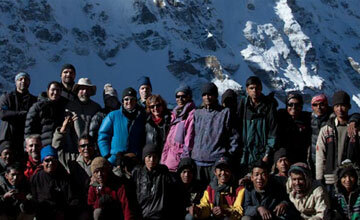 Kanchenjunga circuit trek take to you heart of the Kanchenjunga Himalayan zone . Kanchenjunga circuit trekking is getting popular at present days among nature enthusiasts as it is a long Nepal adventure trekking to the most remote and beautiful area of Himalayas in Nepal’s eastern regions. Kanchenjunga means five treasures of the great snow which is in reference to the five summits that make up Kanchenjunga trekking become more popular. Since, Kanchenjunga trekking is less crowded travelers will be rewarded with a unique insight into Nepali rural lifestyle and its rich culture. Kanchenjunga circuit trek commence at Basantapur after 6-7 hours drive from Dharan. Minimum two days required for overland transportation from Kathmandu . Himalaya Journey Treks & Expedition’s guide led you through beautiful village of Chauki Bhanjyang Dovan sekathum Amjelasa Gyapla Gunsa Lhonak and finally reach at Kanchenjunga pangpema base camp ( southern base camp) then trail return to the Gunsa village & heading through sele le pass / Mirgin la pass 4674m to Kanchenjunga Oktang base camp ( northern base camp). Trail continue descend via Andaphedi Yamphudin Lali kharka Phuphe danda & finally reach at Suketar then by bus or by flight back to Kathmandu. Autumn & spring season is best time trekking in Kanchenjunga but we Himalaya Journey Trekking arrange around the year as per travelers wish and holiday frame. Minimum four weeks holidays required for Kanchenjunga selele pass trekking as well required minimum two person required for obtain Kanchenjunga trekking permit through government registered Nepal trekking agency. Day 01: Arrival in kathmandu 1334m, Himalaya Journey Treks & Expedition’s representative will transfer to hotel , Kanchenjunga circuit trekking briefing with officially arrangements. overnight at Kathmandu. Day 02: After breakfast, Himalaya Journey tour guide will take to for historical monuments sightseeing in kathmandu valley such as Boudhhanath : visit Bodhnath Stupa, one of the best Buddhist shrines in the world, where we observe Buddhist monks in prayer in the monasteries surrounding the stupa than visit Pashupatinath: the most famous Hindu temple in the country, located on the banks of the holy Bagmati River. Here you see Hindu holy men (sadhus) meditating, pilgrims bathing and occasionally funeral pyres burning on the ghats. Kathmandu durbar square: you will enjoy with different Hindus Temple , Goddes Kumari, legend of kathmadu valley etc and prepare for the Kanchenjunga trekking because this day is required to make Kanchenjunga trekking permit with original passport. Overnight at kathmandu. Day 12: Acclimatization or rest day in Gunsa village. During this day you can hike up to the selele pass base camp. Day 26: Ilam Bazaar drive to Kathmandu. Drive approximately 6-7 hours. Day 28: After breakfast, Relaxing/shopping with own activities , Himalaya Journey Treks & Expedition's representative will drop to Kathmandu international airport for onward journeys or if you have time to stay in Nepal will arrange any other trip such as Chitwan Junlge safari tour, Lumbini tour, Chitwan jungle safari tour , river rafting etc. Highest access of the trek: Kanchenjung base cmap 5,150 m.
Himalayan sights: Mt. 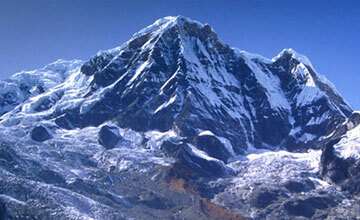 Kanchenjunga 8586m, Mt.Lhotse 8516m,Mt. Mt. Makalu 8463m,etc.